According to the National Weather Service, the tornado risk has now moved into what I would call the serious category. Please compare the map below with the one I posted earlier this morning. 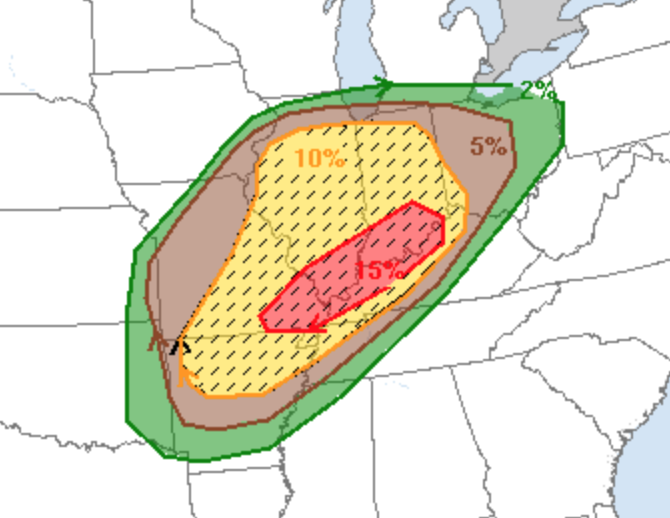 The original elevated risk, 10% chance of a tornado within 25 mi. of any given point (yellow), hasn't changed much from the earlier forecast. However, the risk has been raised to 15% (red) in the Ohio Valley. This is a fairly big deal if the forecast turns out to be correct. There is the potential for tornadoes to occur well after dark. Please call your friends in this region and make sure they are aware of the risk. While I will not be live-blogging the storms, I'll update at least once this afternoon and once this evening.